Rasnitsyn, A. P., & D. L. J. Quicke (eds.) 2002. History of Insects. Kluwer Academic Publishers. 517 pp. 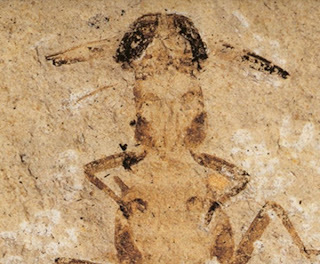 Within the last seven years, we have been blessed by the appearance of two significant textbooks on insect palaeontology that anyone with an interest in the subject would be well advised to read (and if you're not interested in the subject, you damn well should be - see here and here for examples of the sheer awesomeness of fossil insects). Rasnitsyn & Quicke (2002) is a multi-author volume produced by the Russian school of palaeoentomology, while Grimaldi & Engel (2005) is an impressive two-author production. Both of them are more than weighty enough to double as security devices. I've been considering putting some thoughts to paper about RQ since first I read it, and which the subsequent appearance of GE, it only seems logical to compare the two. To be honest, it's a bit of an unfair comparison, because the two books have different target audiences. Rasnitsyn & Quicke (2002) is a reference for the working student or researcher. As such, it tends to be heavy on detail but also heavy on style, with detailed descriptions of technical characters and long lists of references. Each section follows a fairly rigid format, so that readers can find what they're looking for easily. Grimaldi & Engel (2005) is an entirely different matter - while still presenting the technicalities, it is written to be much more appealing to the interested layperson. The composition is lighter, the format less rigid, and while Rasnitsyn and co-authors remain focused on the matter on hand and deal solely with fossil insects, Grimaldi & Engel are concerned as much with living as with fossil taxa. Rasnitsyn & Quicke (2002) is divided into three major sections (a table of contents and a few text excerpts from the book can be found online here), the introductory section, the taxon descriptions, and an overview of insect history. That seems a reasonable basis for dividing this review. Dunbaria fasciipennis, a representative of the Palaeodictyoptera, a Palaeozoic group of plant-sucking insects. Some palaeodictyopterans were exceedingly large, with wingspans of over 50 cm. Photo from Winds of Kansas. The introductory section of Rasnitsyn & Quicke (2002) presents the rationale for the book's organisation, a brief history of palaeoentomology, and a section on taphonomy of insect fossils. The first of these presents us with what is undoubtedly the main failing of the 2002 volume - the classification scheme used in the book. The cladistic revolution and other scientific events that have revolutionised taxonomy in the western countries have not become as widely accepted among Russian researchers. Rasnitsyn opens with a spirited defense of the virtues of paraphyletic taxa, essentially retaining the "evolutionary taxonomy" approach of authors such as Ernst Mayr whereby monophyly (in the broad sense) is just one of the details considered in constructing a classification, and a derived subgroup may be regarded as worthy of taxonomic separation from its ancestors (e.g. separating birds from reptiles). Rasnitsyn explains it thus: "Both similarity and relatedness are involved in a taxonomic system's organising principles, but their application is not arbitrary... Raw similarity is used there as a heuristic method to construct (delimit) taxa while relatedness (monophyly) works as a method to test the resulting taxon." Despite Rasnitsyn's claim that such a system is not arbitrary, it is impossible to scan the resulting classification without being struck by cases of apparent arbitrariness. Why should the combined stem group of Lepidoptera and Trichoptera be particularly associated with the latter rather than the former? Why should the "order Grylloblattida" include a whole host of mostly winged fossil families dating back to the Carboniferous in addition to the single living wingless family Grylloblattidae, when that same assemblage is explicitly stated to also be ancestral to the living stoneflies, earwigs and webspinners in additional orders? Grimaldi & Engel (2005), in contrast, use a more phylogeny-based system. The Russian authors also differ in using a sytem of typified rank-modified names that is not widely recognised elsewhere, so instead of Strepsiptera, Plecoptera and Thysanoptera we are presented with Stylopida, Perlida and Thripida. 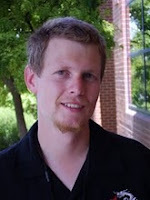 The confusion becomes potentially worse within the orders, because many of the authors for various sections do not give alternatives to the unfamiliar subordinal names used. Rasnitsyn et al. have actually relented somewhat compared to earlier publications, so they allow some major non-typified order names such as Coleoptera and Lepidoptera, but again there seems to be a certain degree of arbitrariness involved. Why is Trichoptera an acceptable alternative to Phryganeida, but the Odonata remain labelled by the equally unfamiliar (and nearly unpronounceable) Libellulida? 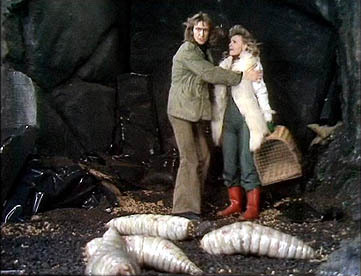 The potential perils of rank-modified names are also demonstrated, I feel, when one considers the bewildering series of Gryllones, Gryllidea, Gryllina, Grylloidea, Gryllidae - so many names just one typo away from complete confusion. Grimaldi & Engel (2005) also win out over Rasnitsyn & Quicke (2002) in their introduction to insect anatomy and terminology. The former present us with a detailed introduction to the jargon, as well as a strong overview on how taxonomy and phylogeny work. The latter give a few not particularly helpful diagrams hidden in the opening for the section on Pterygota - sorry, I mean Scarabaeona - but for the most part, you're on your own, and what do you mean you don't know what a paraproct is? Both books include a good introduction to taphonomy, the process of how organisms become fossils, but I actually think the Russian volume wins out in this regard. The late Vladimir Zherikhin, who sadly passed away before Rasnitsyn & Quicke (2002) reached publication and is one of the researchers to whom the book is dedicated, presents a guide to taphonomy and its interpretation that may not have the whizz-bang factor of Grimaldi & Engel (2005), but has enormous practical value as a student reference. 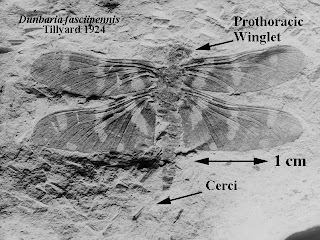 Saurodectes vrsanskyi, a mysterious wingless insect from the Lower Cretaceous. Though suggested to be related to lice (and possibly parasitic on pterosaurs), the supportive evidence is pretty tenuous. Photo from Dracovenator. The second major section, the taxonomic overview, is of course the greater part of both books, and is also where the differences in approach between the two become most apparent. In Rasnitsyn & Quicke (2002), each order and supra-ordinal taxon is given a section divided into subsections: introductory remarks, definition, synapomorphies, range (both time and species), system and phylogeny, and (usually) history. The writing is dense and rapid-fire, and often focused on the appearance and extinction times for various families. 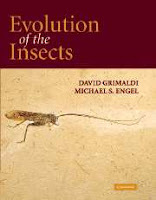 Grimaldi & Engel (2005) present a much more varied range of factoids about each of the various groups, in some places moving into tangential explorations of related issues, so that the chapter on Hymenoptera includes a section on the evolution of sociality, that on Orthoptera reviews the topic of camouflage, while that on Mecopterida (fleas and scorpion flies) discusses the evolution of ectoparasitism. Rasnitsyn and associates leap straight into the insects proper, barely glancing at even the non-insect hexapods such as collembolans and diplurans, while Grimaldi & Engel present us with a background exploration of the other arthropod groups, both living and fossil, discussing their diversity and relationships with insects (though, funnily enough, euthycarcinoids don't even warrant a mention). Both books are widely illustrated, though Grimaldi & Engel (2005) glows with living colour while Rasnitsyn & Quicke (2002) stick to black and white. Grimaldi & Engel are certainly a lot more interesting to read, but if you are trying to look up a specific detail then Rasnitsyn and associates are probably more helpful. Nevertheless, Rasnitsyn & Quicke (2002) does suffer from a severe issue with layout. Illustrations tend to lag behind the sections that they're supposed to illustrate, and to find a figure referred to in the text you may have to look five or six pages into the next chapter. The Russians also win out over the Americans in the last part of this review. Rasnitsyn & Quicke (2002) ends with a section giving a broad overview of insect history. Zherikhin (for terrestrial insects) and Nina Sinitshenkova and Zherikhin (for aquatic insects) present us with explorations of what types of insects where around when, and how they related to their environments at each time. Indeed, I've found Zherikhin's chapter on terrestrial insect history useful not only for looking up what kind of insects were around at a given time, but also handy for finding out what kind of plants. Grimaldi & Engel (2005), in contrast, give us nothing to compare. A final chapter describes the rise of the modern insect fauna from the Cretaceous onwards, but they dropped the ball somewhat on this one. There is one final great difference between the two books whose significance cannot be underestimated - the price. For such a large book, with high quality colour images on more than half the pages, Grimaldi & Engel (2005) is an absolute steal. Amazon (link at the top of the page) is offering copies for only $65 (I assume US dollars), which may not sound cheap, but trust me, it'd be worth it. On the other hand, I recall Toby White (though unfortunately I can no longer find just where) referring to Rasnitsyn & Quicke (2002) as "too expensive for all but the most bloated of pocketbooks", and that at a time when it was available for less than the $988 dollars Amazon is asking for it now. I don't know about you, but I'm not about to sink three week's wages (after correcting for the exchange rate) into a single book. Try and talk your local library into getting a copy instead. Deciding which is the better book overall really does come down to which book you fit the target audience for. If you've only got a non-professional interest in palaeoentomology, and wish simply to feed your curiosity, then there is no doubt that Grimaldi & Engel (2005) is the book for you. The pictures alone are worth the price of admission (check out the invisible grasshoppers on page 206). But try to lay your hands on a (photo)copy of the taphonomy and ecological history chapters from Rasnitsyn & Quicke (2002) - I'm giving the detailed references below. If, on the other hand, you're lucky enough to be working with fossil insects on a professional basis, I suspect that you'll probably find yourself reaching for Rasnitsyn & Quicke (2002) more often due to its superior look-up-ability (and you'll probably be erudite enough to navigate the screwy taxonomy). Overall Champion: Grimaldi & Engel (2005). $988 is just way too much to pay for any book, ever. For that price, I expect pages made from hammered gold leaf. Zherikhin, V. V. 2002a. Pattern of insect burial and conservation. 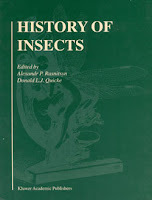 In History of Insects (A. P. Rasnitsyn & D. L. J. Quicke, eds.) pp. 17-63. Kluwer Academic Publishers: Dordrecht. Zherikhin, V. V. 2002b. Ecological history of the terrestrial insects. In History of Insects (A. P. Rasnitsyn & D. L. J. Quicke, eds.) pp. 331-388. Kluwer Academic Publishers: Dordrecht. Quicke's one of my lecturers, I wonder if he knows the text book costs that much!? I'll ask next time I see him. "Overall Champion: Grimaldi & Engel (2005). $988 is just way too much to pay for any book, ever. For that price, I expect pages made from hammered gold leaf." Dreamer! That's only $1.30 per page. Gold leaf (and hammered, at that) would cost considerably more. And wouldn't be nearly as interesting as the book. Off-topic: I have been infected with the 6 random things meme, and now I'm tagging you. The rules are here. If you've only got a non-professional interest in palaeoentomology, and wish simply to feed your curiosity, then there is no doubt that Grimaldi & Engel (2005) is the book for you. As a non-professional interested in paleontology, I can back this up. It's one of the best biology books I have ever read. I actually read it cover-to-cover, something I almost never do. Geez, I can't imagine forking up $988 even for a book that directly deals with my profession. I recently paid $540 for a 5 volume set, which is the most I've ever paid for any book, and even that made me wince a little (lot). Grimaldi & Engel is the tops. I haven't gotten through it all yet - every time I pick it up to make progress I get distracted leafing through to look at all the wonderful illustrations. www.bookfinder.com lists new copies of History of Insects for a mere $420-500. There are a couple of used copies for slightly cheaper.